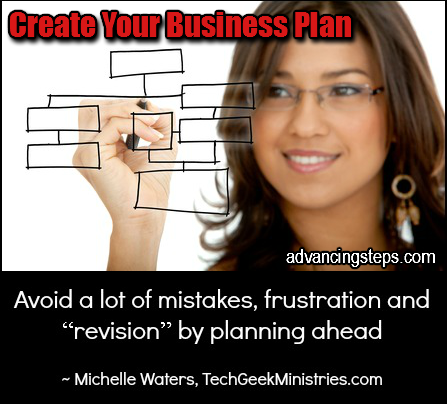 I’m happy to feature this informative post by Michelle Waters of Tech Geek Ministries with key points to consider when planning your business. A raging debate in the world of authors is whether or not it is better to be a pantser or a planner. If you’re not an author, you may be a bit confused about my terminology. You may even raise your eyebrows a bit. But don’t worry – the kids don’t need to leave the room. A pantser is someone who flies by the seat of her pants. She doesn’t plan. She sits down at the keyboard and proceeds to churn out pages and chapters, writing her novel as the mood strikes. If she’s lucky. If not, she’ll be staring at the keyboard and banging her head on the keys instead of her fingers. As you may surmise, the planner is an author who maps out every plot point, creates a dossier on each character, and knows exactly what she’s going to write each time she sits down at the computer. Who do you think is going to to write a successful novel? Which process do you think is less frustrating? Yeah, the planner is going to be able to control her novel and create something saleable with less frustration and revision. Small business owners can learn a thing or two from this. Note: I understand that there is an element of creativity and excitement to pantsing. Some writers and business owners swear by it. Why plan, when you can discover? Planning takes away from the experience. If that works for you, and you’re happy where your business is, by all means keep doing what’s working. But if you want to avoid making mistakes and if you’d like to know when you arrive at your goal, follow along. Think ahead. Are you planning to be the #1 resource for money saving tips in your market within 5 years? Or do you want to be an expert in the field of archery and the top distributor of Genesis bows in your city? This is your long-range goal. Once you have your main goal in place, create some short-range goals that are quantifiable. 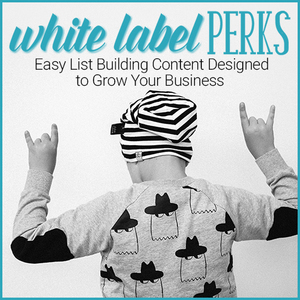 Perhaps you want to attract 100 subscribers to your email list. Maybe you want to sell 30 ebooks, or provide services to 10 new clients. You’ll know immediately when you have reached these small goals. They’re all in line with your long-range plan, and they give you something to celebrate as you travel the path to your goal. Party! OK, put the cake in the fridge, it’s time to get back to work. Just because you’ve reached your short-term goal doesn’t mean you’re done. It’s time to set a new goal. Yes, this means you have to write. And yes, this means you have to write a business plan. Before your eyes glaze over, realize that this isn’t as hard as it seems. I recently wrote a plan for my new business and won 3rd place in a competition for it. I’ve also put together a Business Plan Booster self-study guide to help you learn from my experience. This guide includes a template you can use to make writing your plan much easier. Not only can you use this plan to seek financing for your business, if that’s the route you want to go, you can also use it to record your business’s story, and to start writing the future of your business. You’ll have documented your goals and how you’re going to achieve them. Refer to the business plan frequently to make sure you’re staying on track. That said, your business plan doesn’t have to be written in stone. It can be a living document that you update and revise as you reach some goals and set new goals. What Areas of Business Do You Need To Plan? Like an author must include several plot points in her novel plan, the small business owner must think out several aspects of her business, including finances, marketing, product or service line and support. How are you going to fund the startup and growth of your business. If you’re working full-time, you may be able to bootstrap your own company. Some people borrow money from relatives, raise money in a garage sale, or borrow money from more official sources, like banks. In some service-based businesses, owners might be able to earn the money needed to run the business from their projects alone. New business owners must consider two different areas when preparing their marketing plan: Target market and Unique Selling Proposition. Your target market is the people who need your product or service. No, that’s not everyone. If you’re selling comfortable career pants, your target market might be teachers or office professionals. A stay at home mom is not going to be your market. This is important to know when you’re planning your strategy for reaching potential customers. The second important element of your marketing plan is your unique selling proposition. This is what sets you apart from other businesses. Perhaps you’re the only chemical-free plant nursery in your area. One of my colleagues built a six-figure business selling pregnancy tests online. She set herself apart by offering 24/7 customer support via phone. People could buy the tests, and also seek advice, from the privacy of their homes. She also sold related products, like morning sickness pops, as part of her line of products. Who are you selling to and why should they buy from you? Answer these questions and you’ll be well on your way to starting a successful business. Yeah, this goes with out saying. You have to know what you’re going to sell. But you’d be surprised by how many people will setup a website, begin posting – but never offer anything. Some people lack confidence, others lack follow-through. I recommend not being either one of them. Be brave, plan ahead,and get out there! Once you know what you’re planning to sell, you’ll need to figure out how to produce it. If you’re writing an ebook, you’ll need to plan your material, research, write, revise and publish. If you’re creating a physical product, you may need to create a pattern, source materials, hire someone to prepare your item for mass production, and figure out how you’ll store and distribute the item. All of this costs money, so you’ll need to factor these costs into your financial plan. Once you have your products flying out the door, or people clamoring for your services, how are you going to support them. You don’t want to be up at 3 a.m. answering emails, so plan how you’re going to scale your support team. This could including hiring family members, outsourcing to subcontractors or hiring full time staff. Planning will ensure that you’re not caught with your pants, uh, down. What this all boils down to is that you need to plan your business in order to be successful. Not only do you have to consider the things I’ve mentioned, but also your strengths, weaknesses, opportunities and threats. This is called a SWOT analysis. I won’t get into it here, but you can consider each of these elements as you work through the sections of your business plan. So yeah, you can “pants” a novel, if you don’t mind writing a bunch of unusable content and revising it a bazillion times. But you can’t afford to do this in your business. Plan ahead to avoid some trouble, and take care of what you do face. 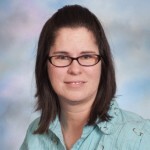 Michelle is an entrepreneur, teacher and Christian who loves words, and learning new things. She recently wrote an award-winning business plan and would love to help you start and manage your successful small business. Thank you for the opportunity to write for your website. I’m looking forward to answering any questions your readers may have. I appreciate all the great advice. Thanks Michelle!